RAILROAD.NET • View topic - Blizzard of '78 and the mbta. 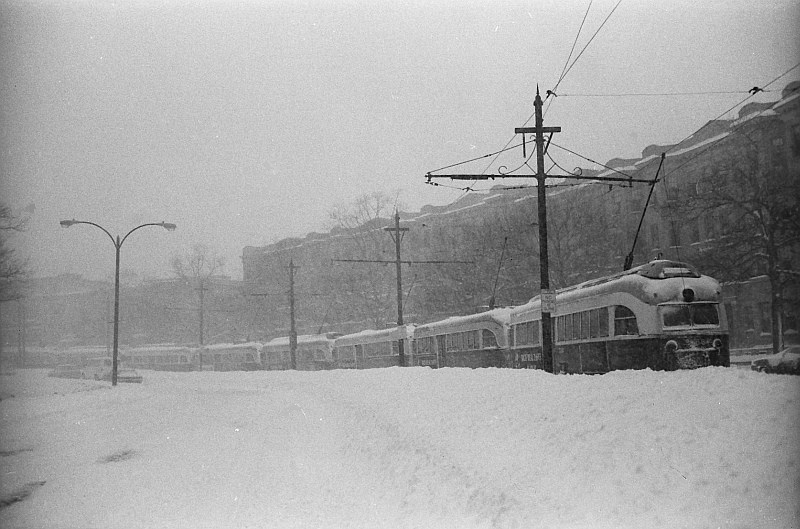 Blizzard of '78 and the mbta. As its the anniversary of the blizzard of '78 and I wasn't around then I'm wondering what effect this had on the mbta at the time. Thanks for any replies from people that experienced one hell of a storm. Re: Blizzard of '78 and the mbta. Wonderland station was closed due to flood damage following the “Blizzard of 78”. Trains terminated at Revere Beach. Buses were run from Revere Beach to Wonderland. Normal service to Wonderland resumed in March. In February 1978, all service was operated to Downtown Boston and South Station (instead of Ashmont) following the blizzard of '78. This emergency service became permanent, and Hudson never operated to Ashmont again. -Unda's, using the name Interstate Coach, began emergency operation of Boston-Stoughton commuter service in February 1978, following the Blizzard of '78. The service proved successful, and was retained as a normal operation. -Metropolitan Coach began emergency express bus service from Boston to Lexington via Route 128 and I-93 in February 1978 (after the Blizzard of 78). This route became a regular service after the emergency conditions had passed, and was later transferred from Metropolitan Coach to affiliate Hub bus lines in 1979. The Gray Line took over this route by the early 80s (see Gray Line entry). IIRC, service never resumed on the Lexington/Bedford branch after the blizzard. Nope, Lexington Branch was the previous year. Last run there was January 1977. It was interesting... I remember having to swim over a six-foot-high snow drift to get out of my Somerville apartment. One of my co-workers was among the many who were trapped overnight in buried cars on Route 128 the first night of the storm, getting evacuated the next day by the National Guard. Most commuter rail service was running within a couple days after the storm ended, on special shuttle schedules, and the underground portion of the T was operating as well. Amtrak also restored Northeast Corridor service within a day or two, running slowly but running. Since driving was banned throughout the region due to impassible roads, trains were the only way to get around if you had to travel. I remember walking from my girlfriend's apartment in Cambridge (where I had holed up for the duration of the storm) to Harvard Square and taking the Red Like to South Station to photograph snow-covered equipment. The North Side commuter service was all RDC in those days and trains ran with B&M GP7s/GP9s on both ends to plow the way. What about the El? I'm not a weather person, but would snow have piled up on elevated surfaces as quickly as on the ground? wicked wrote: What about the El? I'm not a weather person, but would snow have piled up on elevated surfaces as quickly as on the ground? I would imagine so. Bridge decks freeze over before the regular road surfaces do. So it probably would have stuck to the elevated especially quick. Wasn't the el's deck mostly open to the ground? That would allow a lot of the snow to fall down onto the street below. The El's right of way, being made up of steel bents and wooden beams was a natural porous strainer for snow, an experience that most Boston motorists experienced at the time when a train went rumbling by overhead - chunks of snow and ice would come cascading down onto your roof. The main problem was the station platforms and stairwells which were not so porous and had to be cleared before the general public could safely use them. For a while, the T hired snow sweepers off the street as the storm was way beyond the limits of it's own work force. This looks like it could be the new blizzard of '78 since it looks like we are gonna be getting the same amounts from 35 years ago. Ch 5 has boston getting 27in at the airport. Worcester just above 30in. Welcome back to New England's winter everyone. I'm expecting the mbta to have delays on every single line and service. The link shows cars westbound from Allston St to Warren on the Green B line. Either a train couldn't get up the hill or autos blocked the way. This coming storm is going to be a mini-disaster if the high end forecasts are correct. The T is ill-equipped to handle this, especially now with half its infrastructure falling apart. This might be the first time the T runs it's snow storm schedule. It'll be interesting to see how it pans out. For the commuter rail, I can see a few issues with timing and capacity cropping up and causing some major headaches. Not to mention the winds their predicting will play havoc on old tree and cantanary along the NEC. Downeasters over the years, but that was in a short notice emergency situation. Maybe. P&W would pony up a couple of locos.